With the time zone difference, the Academy Awards started at something like 9:00 Monday morning but was thankfully rebroadcast Monday evening. Tawn and I made a date of it: I prepared dinner, using the rotisserie feature in my oven for the first time. This was accompanied by a demi-bouteille of Paul Goerg non-vintage Brut Blanc de Blancs Champagne, a gift from our friend Bill K in Florida when he was visiting this winter. Thanks, Bill – it was perfect with the right acidic notes to cut through the richness of the avocado and the mustard glaze. For dessert, I baked an apple and rhubarb cobbler complete with a little Oscar statuette on the crust. Maybe the picture doesn’t show the details very well, but I thought it was a nice touch. Left: Detail of the cobbler. Can you see Oscar on the crust? Things turned out quite nicely and I was more than a little surprised that the rotisserie feature actually worked so well. I’m not necessarily a big “let’s have a slab of meat” person, but it adds a greater variety of potential menu items to future dinner parties. I was originally going to do a roast chicken but when I arrived at Villa Supermarket they had dismembered all of the chickens for the day. All I could have was parts and I can’t rotisserie parts very well. What about the show? The show! The show! Thankfully, when we watch American television, it usually has no commercial breaks, so the Oscars moved much more quickly. However, some odd editing had been done and it looked like maybe a few other parts had been inadvertently edited, too. The second award that Will Smith’s son was presenting jumped directly to the winner suddenly being on stage – no idea what the award was for, nor who was nominated. Nor, for that matter, who that winner was. Ellen? I like Ellen, but I didn’t think she was very funny at the Oscars. I thought most of the audience’s laughter was just feigned politeness. Could we have Billy back, please? Or maybe Steve Martin again… he was funny. I’m glad to see a more international group of movies and actors being honored and hope the future looks more like that. My question about The Departed, though: why wasn’t Infernal Affairs ever honored? The original movie was much better than the remake, despite Scorsese doing a fine job. Can we get a rule put into place where you can’t do a remake of a movie for at least twenty years after the original? In the end, I went to bed before it was all over. Maybe if we throw a big party next year, or go back to the US in time to attend Albert’s annual soiree, then it will be more fun. The wai – the gesture in which hands are placed prayer-like at chest level – is one of the most visible signs of Thais’ characteristic politeness. It is used as a greeting, as a departure, as a thank you, as a sign of respect from a person in a lower social status to a person in a higher one, and in most circumstances it is also used as a response from the person in the higher social status. 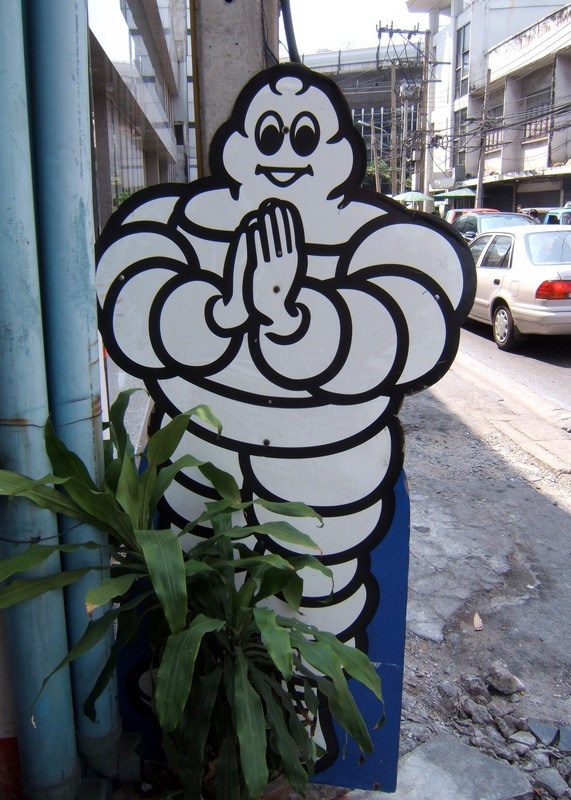 From my first visit to Thailand in 1999, I’ve been tickled by the sight of foreign firms’ corporate icons – especially the Michellin Man – wai’ing outside their respective businesses. 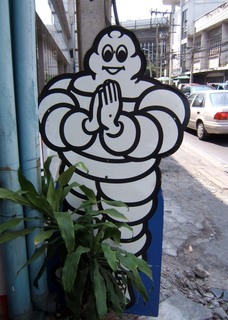 It is an interesting way to adapt to local customs although the thought of a large stack of automobile tires being respectful is a tad bizarre. Is there a Thai equivalent? 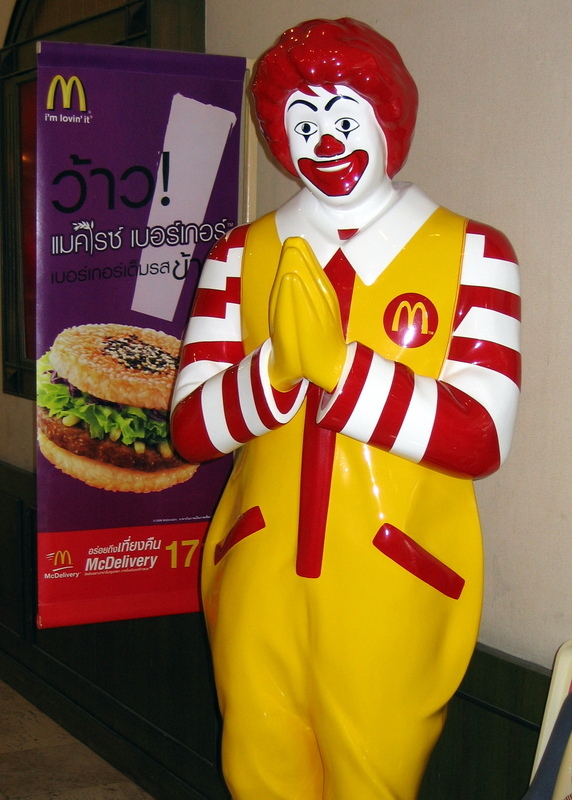 I can’t think of any particular Thai corporate icons that wai, but I’m sure they exist. At Kasikorn bank, after you’ve completed the ATM transaction there is a stylized animation of a woman wai’ing deeply at you, her forehead touching her fingertips in the deepest and most respectful of wais. Outside Thai restaurants everywhere there are often a pair of wooden statues showing two traditionally dressed woman – you may have even seen these at Thai restaurants elsewhere in the world – wai’ing you at the front door or near the entrance to the restaurant. Friday afternoon the Australian, Canadian and British embassies released warnings to their citizens regarding reports of an increased threats of bombs by Islamic separatists from the south of Thailand, in Bangkok. There had been reports in the Thai media that the government thinks that there may be several hundred separatists in universities in Khrungthep and perhaps as many as 10,000 “front-line” supporters. The embassies’ warnings identified shopping centers and public transportation as likely targets. Saturday morning the English-language newspapers reported these threats in above-the-fold headlines. In the Thai-language papers, the story was reported differently: “Farangs blow bomb threats out of proportion,” read one, using that play on words. Ken called his mother in Florida as soon as he heard about the warnings, to assuage her fears. Unfortunately, she hadn’t heard about the reports, so his telling her not to worry only caused her to worry more than she had before. The best of intentions. Saturday evening, Tawn and I tried to reignite our efforts to eat more modesty. While we haven’t been going overboard, over the past month we’ve noticed that we’ve been eating out more often and usually at places that are getting a bit more expensive. Let me put this in perspective: by “more expensive” I’m talking about a meal that totals 600 baht for two people – US$17.15. 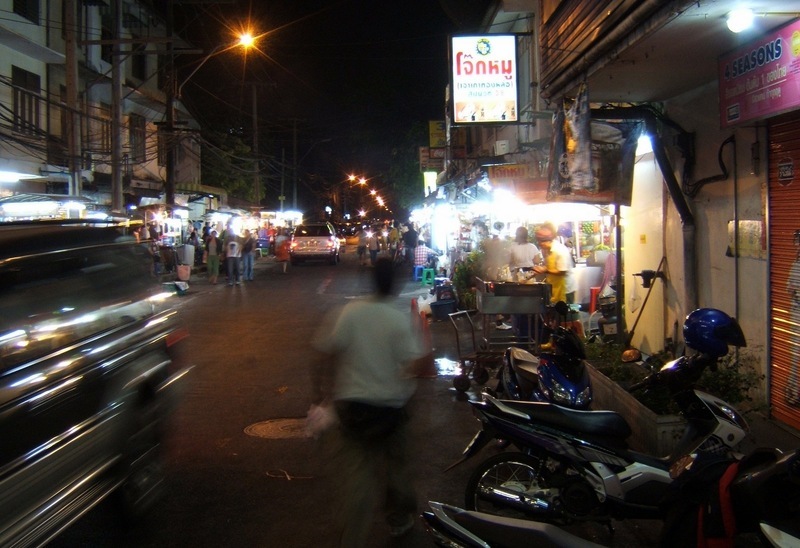 Not outrageous but considering this: Saturday night we went to Sukhumvit Soi 36, a strip located next to the Thong Lor Skytrain station that has a row of food vendors on either side of the street. We had noodles and jok – rice porridge – and even with sticky rice and mango for dessert we only spent 200 baht. Who says you can’t eat well while eating frugally? Above: the scene on Sukhumvit 36 at 10:00 pm. We made up for our Saturday frugality with a nice lunch on Sunday, meeting Paul and Nicha for dim sum at Jasmine Restaurant in Times Square. Paul is Tawn’s cousin – his mother is Tawn’s father’s sister – but was born and grew up in Los Angeles. He has lived in Thailand with his wife, Nicha, who is also Thai, for the past several years. Despite being close in age and getting along well, we don’t see them very often. In fact, it has been nearly a year since our last meal together. Hopefully this changes and we will see more of them, because lord knows we can use all the familial support from Tawn’s family that we can get. We concluded the weekend with a show of The Queen starring Oscar-nominated actress Helen Mirren. Right now it is playing at only one cinema with one show each day, although I think it goes wider in two weeks. We wanted to see her performance before the Academy Awards, which are on at this very moment but I told Tawn I would wait to watch the rebroadcast with him this evening. He almost called in sick this morning when he remembered that the awards were on today. So who wins? Well, I have my money (figuratively speaking) on Forest Whittaker, Helen Mirren, and Adriana Barraza, and I have no thoughts about Best Supporting Actor. As for Best Picture, I haven’t seen “Little Miss Sunshine” or “Letters From Iwo Jima” because they have yet to open in Thailand and I refuse to buy bootlegs on the street. Don’t spoil the surprise for me… the awards are rebroadcast starting a 8:45 pm local time, Monday evening – that’s 8:45 am EST Monday. Last Saturday, Tawn’s school friend Pim called with the news that her paternal grandfather, who had been ill for about five years, had passed away. While this was sad news for the family, I suspect there was some relief that his suffering has ended. This death also opened a door of opportunity for me, to attend a Thai funeral for the first time. Pim’s paternal grandfather, Khun Prasit Ourairat, was a very big man. Formerly the governor of the Thailand water utility, he was also the founder of Rangsit University, a large private university in Phatum Thani province, just north of Khrungthep. Because of this, his funeral may have been a bit larger and grander than the average Thai funeral, but Tawn assures me that it was otherwise representative. 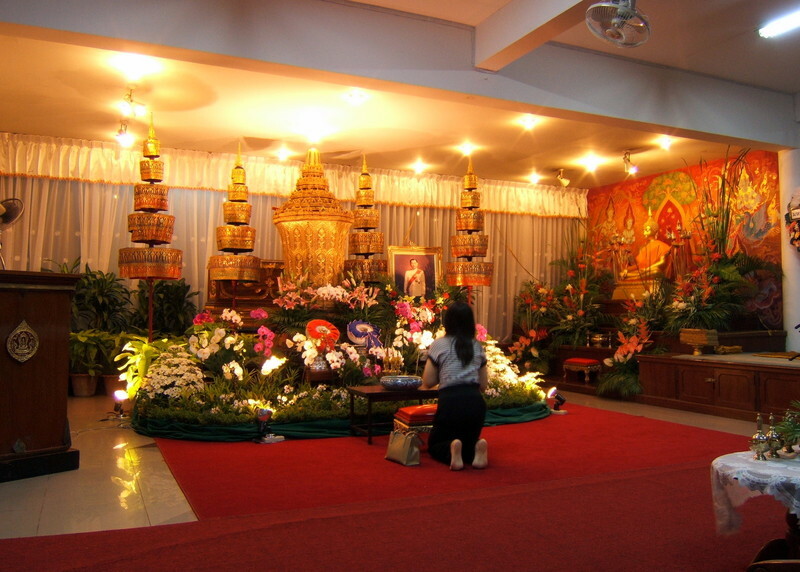 Thai funerals are usually seven-day affairs, generally commencing the day after the decedent’s passing. Being a nation that is 95+% Buddhist, almost all funeral services are held at a temple although in some smaller communities the funeral may be held at home. The family is assigned a sala – pavilion – at the temple and the body, after being washed ceremonially (sprinkling water on the decedent’s hands in a gesture of respect), is placed in a coffin that is more or less your standard box-like affair. Tawn tells me that the washing of the body is the main place where people grieve over the loss of their loved one; it is the time when they first confront the reality of the loss. 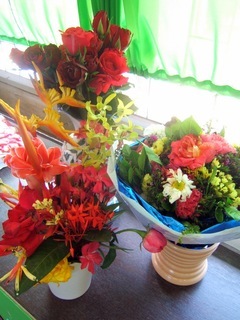 Flowers, pictures, etc. are displayed around the coffin at one end of the sala, and there is always a Buddha image in the room. In the case of Khun Prasit, because he held such high status, the Royal Household of His Majesty the King approved the use of a very fancy, octagonal coffin. This is a high honor, indeed, and is not something that common people can use. In this case, his body was not actually placed in the coffin, but was instead in a traditional coffin placed at the back of the flowers with the fancier ceremonial coffin displayed in front. After the ceremony, presumably it will be returned to the Royal Household. For each of the seven days, a service is held at the fixed time of 7:00 in the evening. 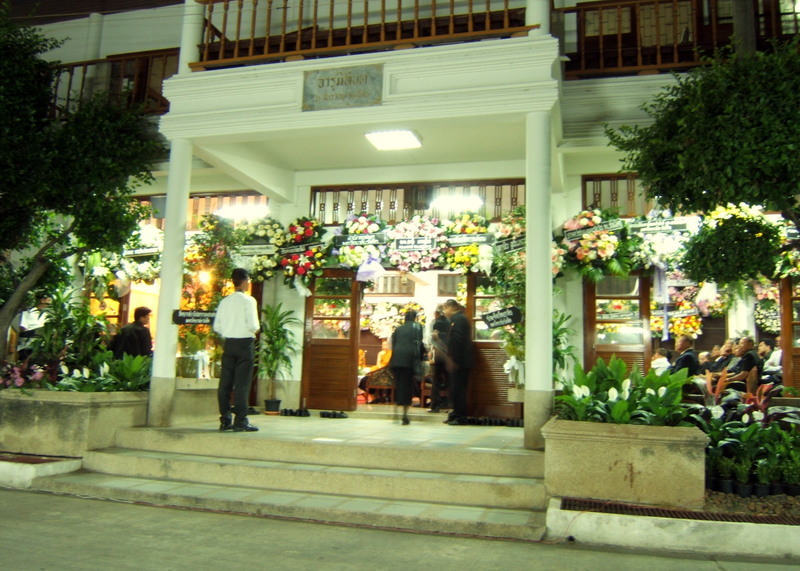 Chairs are arranged in the sala for guests – the number varies depending on the size of the building but there were about 120 guests seated inside in the case of Khun Prasit’s funeral. Additionally, the family had tents set up outside and facing the sala to accommodate another two hundred or so guests. Guests wear black – this is different from many Asian cultures where white is the color worn at funerals as a symbol of purity – and it seems that every Thai man has a black suit set aside just for this occasion. The sala was overflowing with flowers – perhaps 100 wreaths were displayed, hanging on walls and over doorways. While white flowers made a notable presence, the wreaths were still very colorful and each had a sign expressing condolences from this family or that organization or government department. As guests arrive, they remove their shoes and enter the sala at the front near the casket and floral displays. The area is carpeted in red and there is a small padded stool. You then pay your respects by sitting on the floor, usually kneeling or sitting with your legs tucked to the side, bowing three times to the Buddha image off to the side of the room – touching your forehead to your fingertips on the ground – and then bowing once to the deceased. Tawn explains that normally you would light incense, too, but with the large number of guests the amount of smoke would become overwhelming, so in this case no incense was lit. Over the course of about 45 minutes, the monks conduct four rounds of chanting. The chanting is in Pali, the Sanskrit-derived language in which Buddhist texts are written, and each lasts maybe 7-8 minutes. 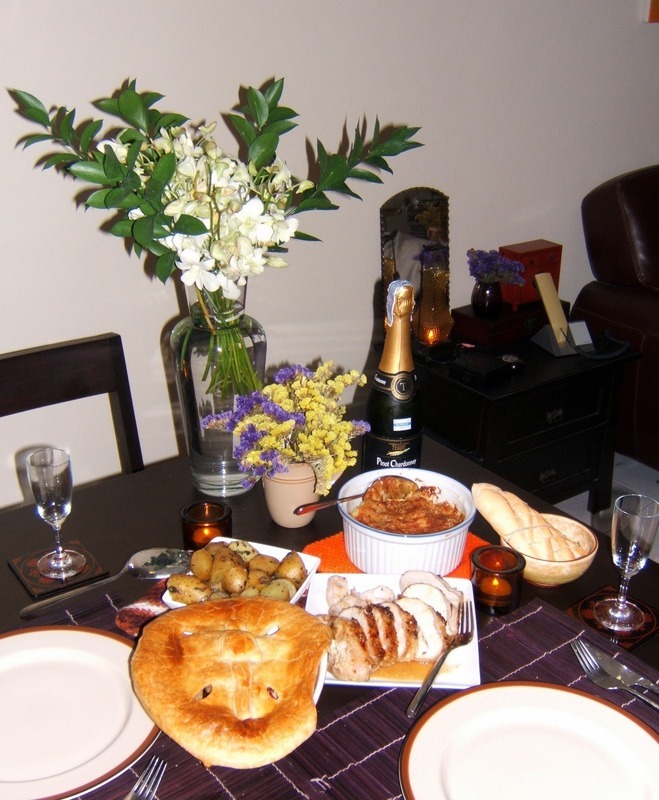 There is a break of a few minutes between each and, Tawn says, usually between the third and fourth round a light snack is served to guests. During the chanting, guests sit with their hands in a prayer-like position, but often are holding respectfully quiet conversations with each other. During the breaks the volume of chatting increases a bit, but all in all the manner is respectful. As I mentioned, there are seven days of services. Each day a different person or group of people sponsors the services – a friend of the family, colleagues of the deceased or of his or her spouse or child, or an organization with which the deceased had been associated. In this case, the first three days of mourning were sponsored by His Majesty the King. At the conclusion of the service, small snack boxes from S&P restaurant were handed out to guests as they departed. Generally, as I mentioned, snacks would be served between the third and fourth rounds of chanting. However, I think since it was a Sunday evening and the temple is on the outskirts of the city, a to-go snack box afforded guests greater convenience. Pim’s father, whom I’ve met a few times before at family meals, invited Tawn and me to join the family for some noodles and food that had been set up near the sala, but we politely declined as Pim was giving us a ride back into town. Having only observed one day of the mourning, I think I missed some things about which I’m curious, especially how Thais express their grief. The answer may lie in what happens after the seven days: the cremation service. This is also held at the temple and in many cases does not happen until the 100th day after death. While more and more families are opting to get the cremation over with after the seventh day, the rationale behind the 100 days is that the spirit, when it leaves the body after death, sometimes is confused about where to go and will stay around the body. Waiting 100 days gives the spirit time to find its way. Additionally, as Tawn explains, the 100 days provides time for the family to let go of their loved one. The body is in a safe place, at the temple, and so they are comforted by the knowledge that their loved one is under the protection of the monks and the Buddha. This gives them time to go through the grieving process before the cremation service, which is the final goodbye. The service usually draws an extended crowd, not only immediate friends and family. The coffin is carried from the sala around the bot – the main chapel at the temple – three times and then to the cremation sala. There, mourners are given a small candle, a stick of incense, and a wooden flower – these are the “holy trinity” if you will, of Buddhist prayer – and the mourners will throw these into the fire. Doing so, they become part of the fire that sends their loved one to the next life. After cremation, some people have the ashes interred in a wall or chedi (pagoda) at the temple with a small memorial plaque with their name and picture on it. Other people will have the ashes scattered. Well, the Year of the Fire Pig has officially started, preceded by an unrelenting barrage of firecrackers Saturday afternoon as local businesses and properties made offerings at their spirit houses and exploding firecrackers to scare away any bad spirits before the start of the new year. Those things are loud and up on the 25th floor we could hear them from buildings all around us. To start the year off right, we had friends over for dinner last night. Unfortunately, I suffered a number of accidents and mishaps all evening long: I burned my wrist on a hot pan and then my hand when lighting a candle; stumbled over a chair; and overturned a creme brulee. Not particularly fortuitous for the year to come. For whatever reason, butane is difficult to find here. Tawn stopped at a half-dozen shops yesterday and had no luck finding any, so I had to use the broiler in my convection oven to brulee the creme. It didn’t work very well. I think I saw butane at Central Chidlom so will go back there today or tomorrow and stock up. Year of the Rabbit (Tawn): Good prospects and fortune await “bunnies” in a well-aspected, happy year when you make positive progress. You’ll be as popular as ever among your wide circle of friends and family. Love lives are also promising in such a memorable year. Work is also encouraging, but try being bolder in promoting your skills. Stay alert for opportunities and for most of a rewarding year you’ll hopping around delightedly. Year of the Dog (Chris): Man’s best fried can relax. The calmer pace of the Year of the Pig is much to the liking of over-anxious dogs, who tend to fret under pressure. Much headway can be made by capitalising on opportunities, with your characteristic loyalty highly appreciated and rewarded. Your “pack” at home will appreciate your considerate nature in a satisfying and often exciting year. These horoscopes really don’t tell me anything useful. Who writes these things? Oh, the tourism authority. Right, that explains it. This will be a year of change, leading towards eventually settling down. After much searching, you will make a large investment. Uncertainty about career will be cleared up as longer-term arrangements are made. Extended family will face obstacles in which some resolution is reached, but the year will end with some issues unresolved. How’s that sound? Self-fulfilling enough? Especially when you consider that Tawn and I have been going condo hunting pretty much every weekend. A “South of the Border” theme party has stirred outrage at a Silicon Valley university after students showed up at the bash dressed as Hispanic janitors, gardeners, gangbangers and pregnant teens. Photographs from the private, off-campus party organized by Santa Clara University students in late January appeared on the Internet soon afterward, prompting an outcry on campus. One image shows a partygoer with a balloon stuffed under her shirt, making her appear pregnant. In another, a woman wears pink rubber cleaning gloves and carries a feather duster. “A lot of people have the idea that Mexicans or Latin Americans are all like that, and that’s wrong,” said Nadine Rasch, 18, a finance major from Guatemala, who did not attend the party. Paul Locatelli, president of the nearly 8,400-student Jesuit university, has condemned the party. No students have been disciplined, but a campus spokeswoman said the school is investigating the party and that the university’s code of conduct extends to students who live off-campus. A protest march organized by students attracted 250 people Tuesday, and the campus has held meetings and plans a forum for this Thursday. What an embarrassment. I can’t believe that something like this would happen in this day and age, especially in the Bay Area. I’ll be writing to the student newspaper to express my shame at being affiliated with SCU. Frequently when walking along the sois of Khrungthep, one encounters things that make you stop, scratch your head, and wonder, “What is that all about?” One of Thailand’s more advanced efforts to discourage smoking among the populace is a restriction on the display of smoking advertising or paraphernalia, including cigarettes themselves. Retailers can sell cigarettes, but the packages must not be visible to the public. 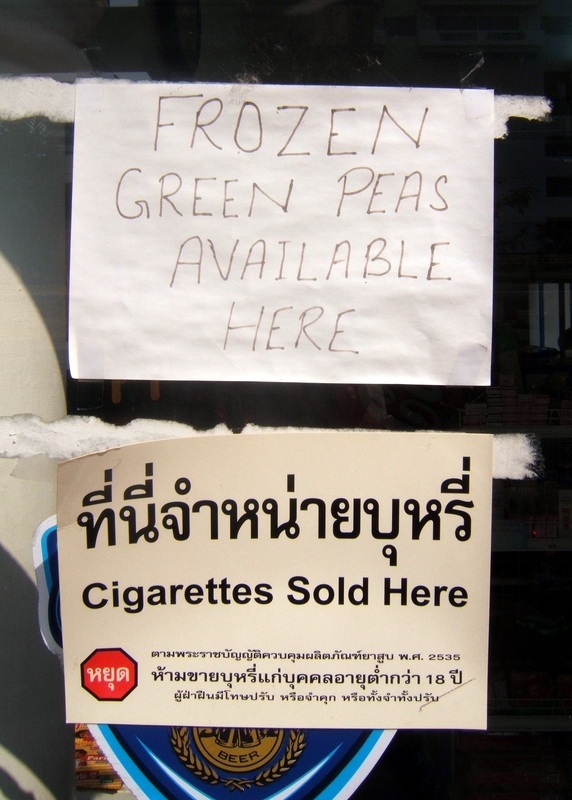 Instead, they are allowed to put up signs – specific ones designed by the government – that say “Cigarettes Sold Here” along with a health warning. Is it some sort of commentary on the owner’s feelings about the government’s paternalistic restrictions on cigarette advertising and display? 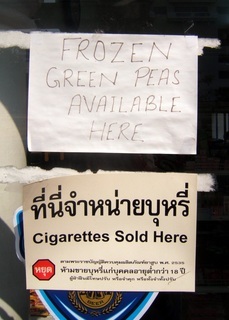 Or are frozen green peas a difficult commodity to find in that area and carrying frozen green peas lends this retailer a special competitive advantage? Wednesday was Valentine’s Day, a holiday that is well-celebrated in Thailand for all its commercial potential. Tawn explained that it is filtered through a uniquely Thai lens: since “status” and “face” are such important concepts in this hierarchical society, the purpose of Valentine’s Day especially for young women, is to receive large bouquets of flowers that they can then carry with them the whole day, showing off in a peacock’s tail feathers-like way that they have a very loving boyfriend. A bit like having the biggest rock on your engagement ring, but more prominent and preliminary. 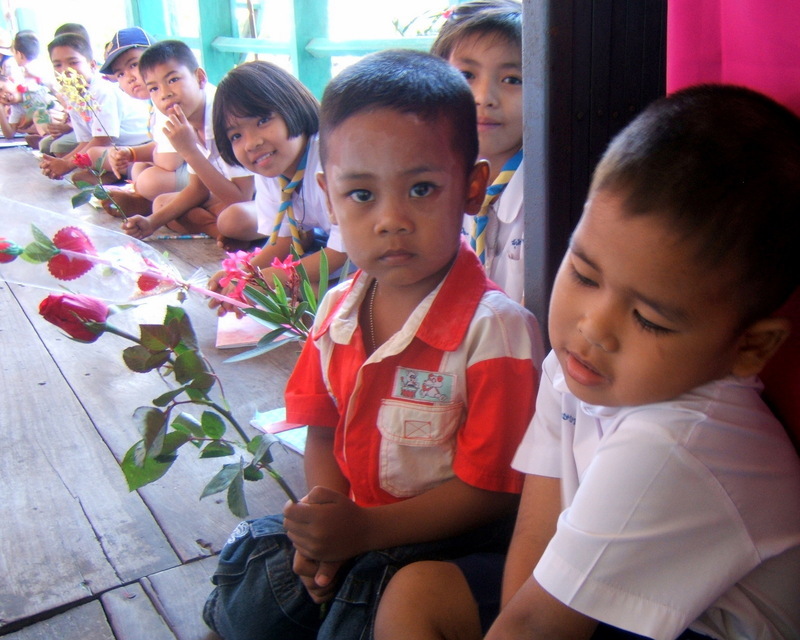 Since they have a farang teacher (me), the teachers at Bangkhonthiinai School thought it necessary to celebrate Valentine’s Day. When Tod and I arrived, a table was set up and each of the children in turn queued up to present us with a rose, a flower, a gift, a card, a candy, etc. It was very overwhelming, especially when you consider that these children do not have a lot of money. 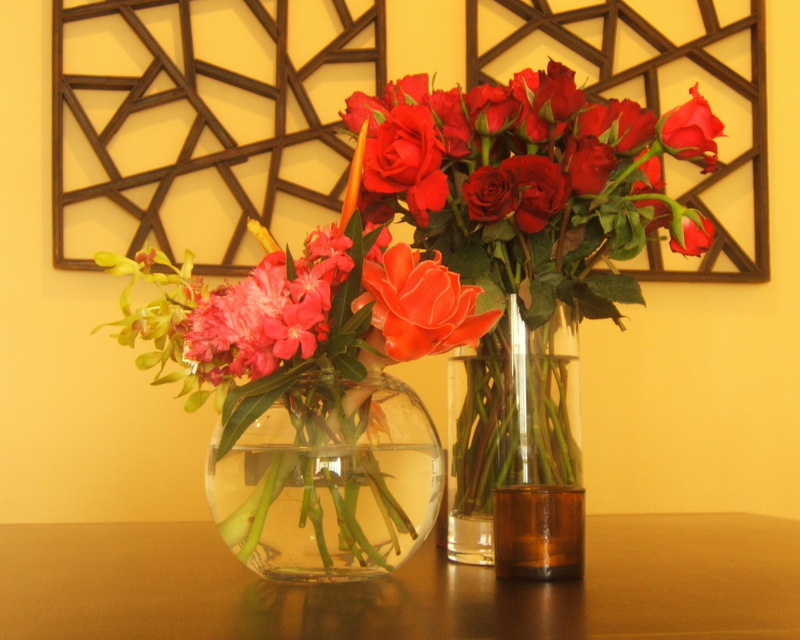 We wound up with three over-stuffed vases, which Tawn make good use of once I returned home. With the older students, we had them line up with boys on one side of the room and girls on the other, the lines meeting at the front of the room, and they practiced these sentences as they gave a rose, a vase of flowers, a card, or a chocolate to each other. 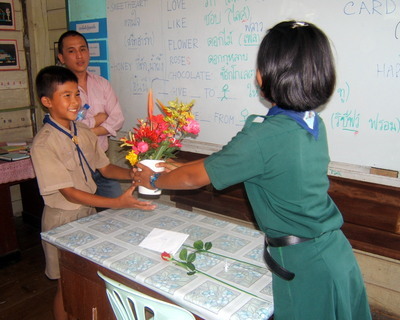 Left: One student gives flowers to another while Khruu Kobfa (“Teacher Kobfa” – Tod’s given name) looks on. Afterwards, we practiced saying and writing the various greetings and endearments you would use for a Valentine’s greeting “Sweetheart” translates literally into Thai. “Mon petit chou” does not. Finally, we sat down to write Valentine’s card, using some cards that Ken had brought back from the United States. (Note to Ken – I learned Tuesday that you can buy Valentine’s Day cards in bulk at MBK Shopping Center. Who knew?) The younger children had goofed around too long with their spelling test so only had about 30 minutes for cards. The older children had about an hour. It was fun as the children are very effusive and draw pictures and add stickers to decorate their cards. Hopefully there are some happy mothers, fathers, siblings, friends and sweethearts out there. When I asked the younger children if any of them had a “tii-rak” or “fan” (literally, a “one that I love” or a “boy/girl friend”) many enthusiastically said they did. 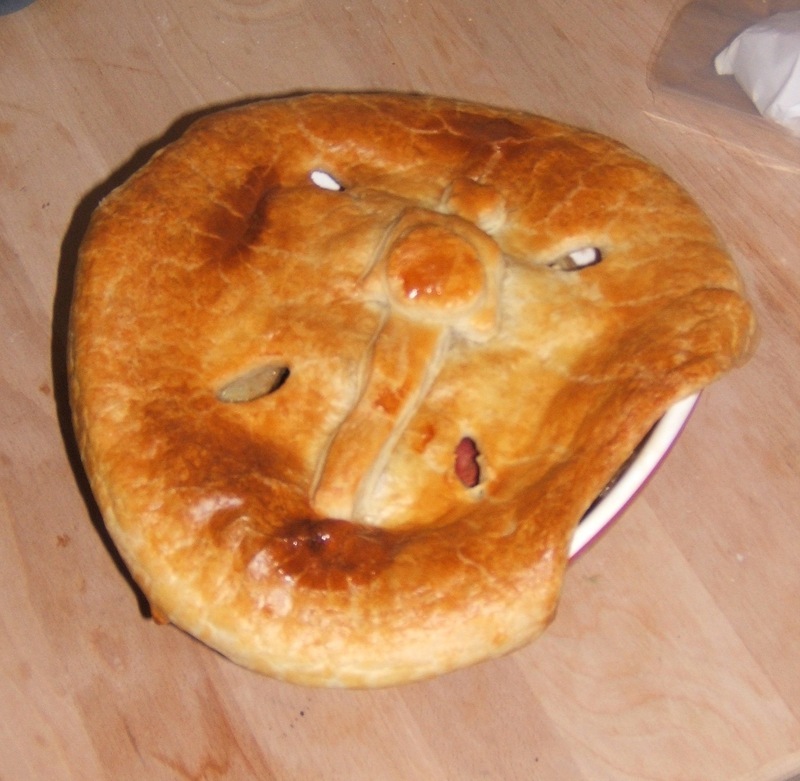 When I asked the older children, most of them blanched and made a face of disgust. Left: The flowers after Tawn did his magic with them. Wednesday evening Tawn and I met up at the Esplanade and had Japanese food at Wasabi Restaurant and then watched a sneak preview of the new Drew Barrymore / Hugh Grant movie, “Music and Lyrics.” It was witty and well-written except for the problem that the romance between the two characters just didn’t feel plausible. But we enjoyed it nonetheless. Interesting thing, though: In one scene of the movie a younger pop singer who has asked Hugh Grant’s aging 80’s pop star character to write a song for her, is performing a concert. Her stage is done up in a vaguely “Asian” theme with a mishmash of Hindu and Buddhist iconography. (The film actually makes a brief critique of western artists who appropriate symbols from eastern religions.) 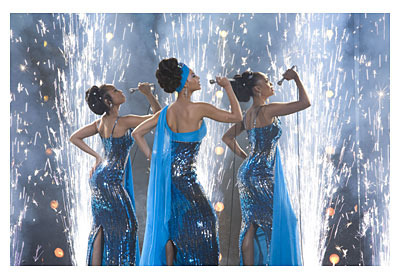 There is a large Buddha statue in the background and Buddha imaged on the dancers’ shirts. But – and this is what’s interesting about it – the film was censored and the Buddha images were digitally masked, much in the same way that certain parts of an adult movie might be masked with these large pixels. Interesting because the mis-use of Buddhist iconography is prohibited by Thailand’s film review board, espcially since in this case the young pop star is prancing around in barely more than a bikini. There was an incident back in 2004 when the Thai government demanded that Victoria’s Secret remove a photo showing a scantily-clad model in a swimsuit with an image of Buddha on it. Contrast this with one of the previews for an upcoming Thai language comedy called “The Bodyguard 2” in which we see the main character shoot another character in the chest three times. The scene shows the fake bullet wounds exploding in the man’s chest. They do look a little obviously fake, but it is still quite graphic especially for young viewers. That is okay, however, but we had best not show the Buddha statue onstage with a scantily-clad woman. No judgement. Each culture has its own values. Concluding a busy weekend of movie-watching, house cleaning, house hunting, and spending time with a visitor from New York, by way of Hong Kong. I met Aaron in early 2001, when I took a trip to New York with Stephanie to visit her friends Keith and Claude, as well as to meet up with her friend Monica who was visiting from Australia. Aaron is one of Keith’s friends and on an afternoon when we all met at Danal for brunch, while everyone was chatting in Cantonese, Aaron was the only one who wasn’t conversing in Cantonese. Not that I need to be catered to; I’m perfectly fine not understanding the conversation. Still, it was a considerate gesture. To top it off, he was also really interesting to talk with. Some time later when Keith and Aaron visited San Francisco, I learned about Xanga from Aaron and about six months later, started this blog. So he deserves credit as the man who started it all. Thursday evening I picked Aaron up at Suvarnabhumi and then he, Tawn and I had dinner at the Joe Louis Puppet Theatre restaurant at the Lumpini Night Bazaar. Frankly, the food was okay and a bit overpriced. But the company was good. 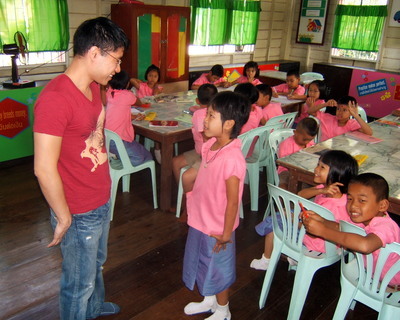 On Friday, we went to Bangkhonthiinai to teach. An extra class this week, arranged because Aaron wouldn’t be in town on Wednesday but really wanted to go to the school. He proved to be a most excellent teacher and the children took to him quickly, perhaps a bit frustrated that he wouldn’t speak any Thai with them, though. “Speak English,” he would say in response to their questions. One of the major exercises was to practice constructing sentences using the words, “who,” “where,” “when,” “how,” and “what.” It is interesting how some students picked up on this really quickly while some of the students couldn’t grasp the pattern of using the article “the” in front of the nouns. “Where is the apple? The apple is on the table.” Thai doesn’t have articles. Top left: Aaron and a fourth grader practice making questions with plastic fruits. Top right: Students practice introducing themselves to Aaron. Lower picture: After class, Aaron poses with his new posse. Notice that one of the girls didn’t want her picture taken and hid behind Aaron despite efforts to get her to stand to one side or another. Friday evening, Tawn and I went to watch “Dreamgirls” at the new Esplanade Cineplex. The showtime was in one of their luxury theatres with tickets running a horrendously steep 500 baht each, compared to 140 for regular tickets. The cinema, which normally would seat about 180, instead had 32 recliners arranged in pairs. Each pair had a privacy wall around them so you couldn’t see any of the other pairs. Recline was about 160 degrees and included a cushy blanket and pillow. Even more over-the-top, when you arrived at the cinema you waited in a small lounge outside. The waiter approached your chair on his knees and took your order: complimentary tea or coffee with cookies, as well as all the traditional movie snacks. Our tea and cookies were delivered by a waiter who was again on his knees. This is the way royalty is served in Thailand, literally. Way over-the-top. 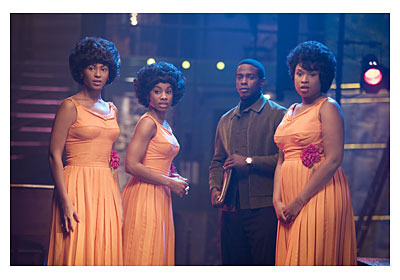 I’ve always felt that film is a medium very well suited to musicals and am buoyed by the apparent revival of the movie musical. Saturday evening we took in a second movie, Alejandro Gonzalez Inarritu’s brilliant “Babel,” written by Guillermo Arriaga with whom he also collaborated on 2003’s “21 Grams.” The complex narrative is a web of four interconnected stories that center around the dueling themes of the power of familial love and the inability to communicate, between cultures, within families, and even with ourselves. What works so effectively is that the four story lines are not told in a synchronous time line. In an early scene we witness a telephone conversation between a maid and her employer, who is thousands of miles away in Morocco. It is only near the end of the film that we witness that same conversation from the employer’s side. Realizing that most of you have seen this movie already, since Thailand is the last place on the planet to get films, I’ll say that I thought there were two masterful scenes in the film. 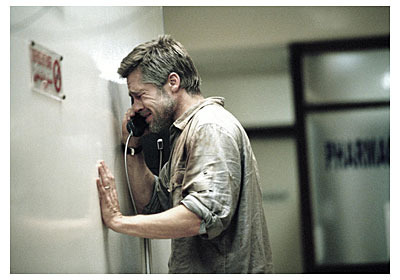 The first was the one at the end of the film (left) where Brad Pitt’s pit character calls from the hospital and speaks with his young son, trying to silence a relieved sob while he son tells him about the mundane affairs of elementary school. The second was the scene (right) in which Rinko Kikuchi’s deaf-mute teenage girl goes to a nightclub with her friends and a friend’s cousin on whom she has a crush. A little stoned and a little drunk, she is at first infatuated and intoxicated with the moment and then crashes when she sees her friend making out with another guy. All of her feelings of loneliness, isolation and being unloved come rushing over her. Suddenly, the pulsing lights and motion, which had seemed so liberating, cause claustrophobia. The most effective part of that scene is that the director alternates between having audio – when we see the scene from a third person’s perspective – and having a nearly-muted audio track when we see things from the girl’s perspective. It is very powerful and Kikuchi’s acting is stellar. Hopefully she wins the Academy Award for which she is nominated. Sunday afternoon we met up with Aaron one final time for lunch at Crepes and Co on Sukhumvit 12. Had a very nice visit and took this picture in the garden before heading home. It was really nice to spend more time with Aaron and hopefully he will visit again soon. After lunch we were in a bit of a rush to get home and meet up with Khun Yo, our real estate agent. I’ll have to talk more about the process of house hunting in future posts, since the process is a bit different in Thailand. We saw four places today, one located on Sukhumvit 53 (one soi over from Thong Lor) that is really nice and reminds me a lot of the apartment I lived in on Eureka Street in San Francisco. It is 70 square meters, 2 bedroom / 1 bath (although the second bedroom is pretty small), has nice light and a compact but efficient kitchen. 5.4 million baht is the asking price. US$155,000. A little more than we were hoping to spend. Yesterday was cram day for the sixth graders at Bangkhonthiinai school. Next Tuesday they have their National Test and so Tod, Ken, Khruu Somchai and I spent the entire day working with the ten sixth graders, reviewing sample test questions. By the end of the day, the poor things were dazed and it was clear that the three boys don’t have much of a chance of scoring well. The girls are in better shape, though. In the morning I told Ajarn Yai that a friend is visiting from New York later in the week and would like to come down and teach, but wouldn’t be here next Wednesday. Would she mind have another English class this week – an especially good offer since only the sixth graders received English instruction this week? Of course, she was fine with that and said she’d like to have me come teach every day. 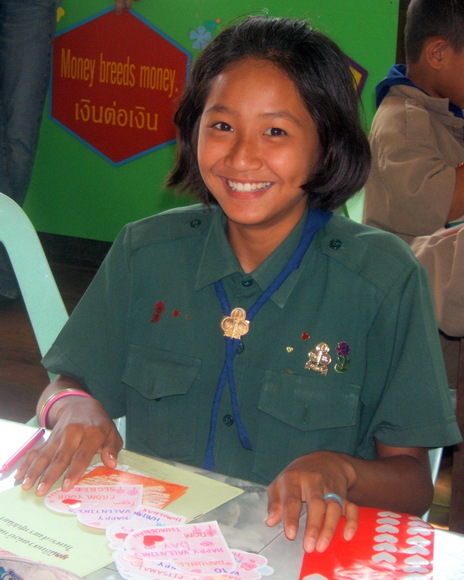 Over lunch, Ajarn Yai asked Tod why so many people knew about her school and Tod replied by “outing” this blog, explaining that I keep a website and that people around the world read about the school and see pictures of the event there. This caused a bit of a stir – not in the way that it would in a litigious society like the United States, but rather in an “Oh, really? We’re famous?” sort of way. Khruu Somchai wrote down the address and then fired up the one working computer and started the dial-up connection. Slowly, slowly, slowly the first page loaded. My mind raced as I tried to think of what content on this page would be deemed inappropriate for young children. Nothing too bad. A picture of Tawn, his mother, and I at the Italian restaurant, a little red-faced. Some “huggy” type pictures. If the students actually browse much of the website they’ll form a more well-rounded picture of me. The real question, though, is how this will affect their behavior in the future. Just like contestants on a reality TV show or subjects of a documentary film, can you ever really forget that you’re being recorded and be completely yourself? I would assume that, children being children, they’ll continue to be themselves. But maybe it won’t quite be the same again. The first sign that things are changing: Ajarn Yai hiring a media consultant. Speaking of documentaries, last night Tawn and I went to watch “Final Score,” a Thai documentary by Soraya Nakasuwan that is currently in mainstream release (even English subtitled at some cinemas) about a group of grade 12 boys in their final year of secondary school and the pressure they go through preparing for and finally taking the “A-Net” or “O-Net” tests. The major exams to access universities. While it wasn’t perfect, it was certainly a world-class documentary and had many particularly well-constructed scenes. It was especially nice to see a film by a female Thai director, which is quite the rarity. Having a female director made it even more interesting that the film focused exclusively on a group of four boys and provided almost no exposure to the story of similarly-aged women, even though one of the main characters, Per, breaks up with his girlfriend right before the tests, leading him to the edge of a breakdown. The challenge with the documentary genre, of course, is that you can’t script out what happens and you may or may not end up with footage that charts the story you expected would be told. In this case the director encountered a few hiccups, but generally extracted very interesting stories and told them effectively. I’d assume that the film will get some play overseas, at least in film festivals.